Gee! Gothenburg! Home turf and we certainly felt at home. Supergig, great crowd, band on its toes, no rain – what more can you ask for? Thanx for stopping by. More than 22.000 ppl. Phew! This tour is going crazy! 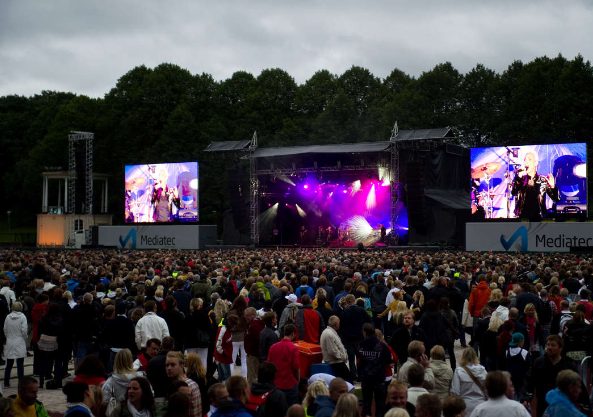 The concert was moved to the bigger venue Slottsskogsvallen after selling-out Trädgårdsföreningen. Roxette started the gig with a minute of silence for Norway. Over 22,000 people attended the gig – which seems to bit previous Per Gessle’s record. Roxette will be on tour until August 2012; 50 concerts done, 80 to go! Good to see those huge video walls. Something that was missed at other open airs. Nunstedt review is crap, as usual. I don’t know I why bother Google Translator with such a lame text. what did you expect.. I really wonder sometimes, what kind of a person one must be to just write negative.. I stopped reading him a while ago. A funny thing accured on stage after OWID. Micke N-S was all set to change guitars for “Radio” but Per was in such a hype to talk to the crowd that he totally forgot to change guitars (so he played with the black one instead of the red one). I work in a hotel reception and was surprised to learn that many of our guests had travelled from all over the world just to see Roxette this weekend – impressive! Those I had a chance to speak with had really enjoyed the concert! Never mind what Nunstedt says. He’s a jerk. So which Expressen reporter did write the supposed 4/5 review for Copenhagen? watching this video, Marie is maybe not singing her best but HOLY %^#*$)(@!!!! her energy is unbelievable!!!! I could never have imagined this when I was watching those 1st NOTP concerts…I absolutely believe in music as therapy and this ladies and gentlemen is the proof! I found this video on youtube. It’s of a few of the stars of an Australian television show called Bondi Rescue at the Gothenburg concert. Bondi Rescue is a factual program that follows the activities of the lifeguards on Bondi Beach in Sydney, which is also the beach in the Vulnerable video. It seems they have been in Sweden promoting surf safety.